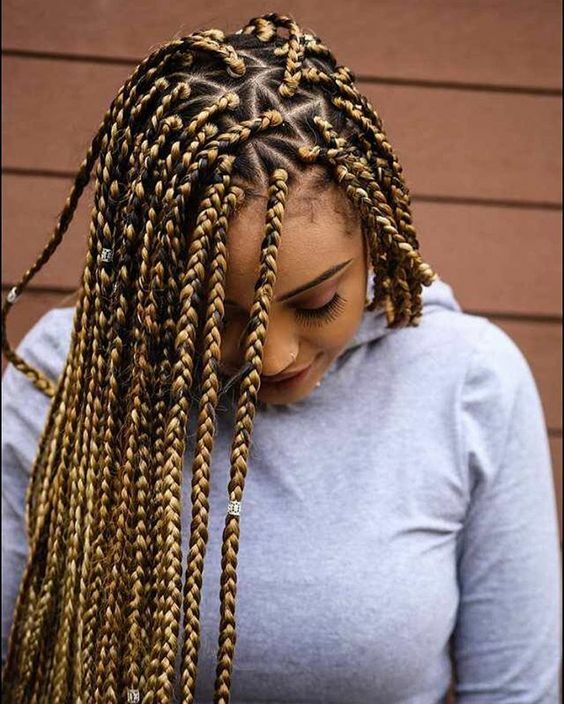 Box braids take their name from the box-shaped parts used to form each braid. But another popular method involves parting each section of hair into a triangular shape instead of a square or diamond shape. 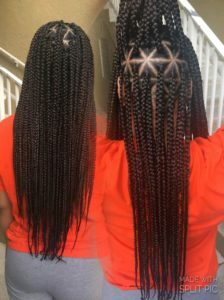 Today, triangle box braids are arguably just as popular as their box-shaped counterparts, and it’s not hard to see why: they have a really aesthetically pleasing look and it’s easy to create cute designs with the parts. 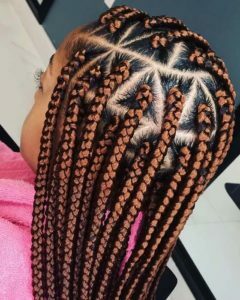 Of course, some people will always prefer the look of classic box braids, but triangle box braids are just as beautiful. If you’re still not convinced, here are 35 gorgeous triangle box braids styles that may change your mind. 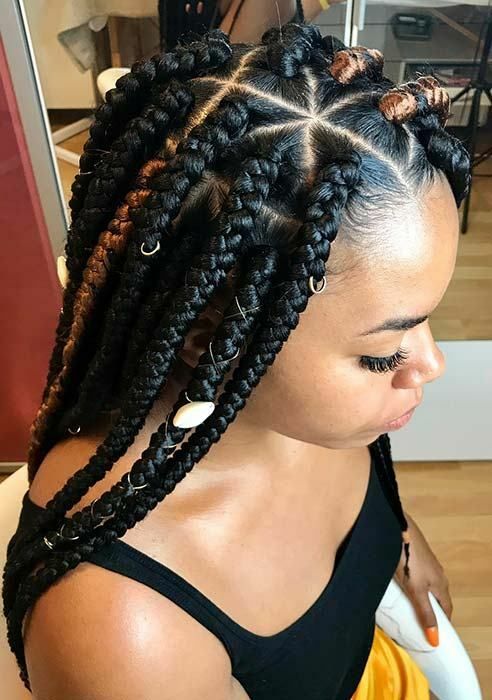 These gorgeous two-toned triangle box braids are adorned with cowrie shells, silver cord, and silver rings. 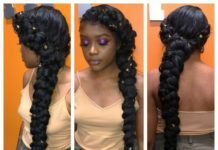 Hair accessories make it easy to create a unique custom look that’s just right for you. 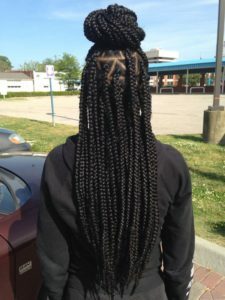 These pretty triangle-shaped box braids are about the size of a pencil: a really popular size for box braids. 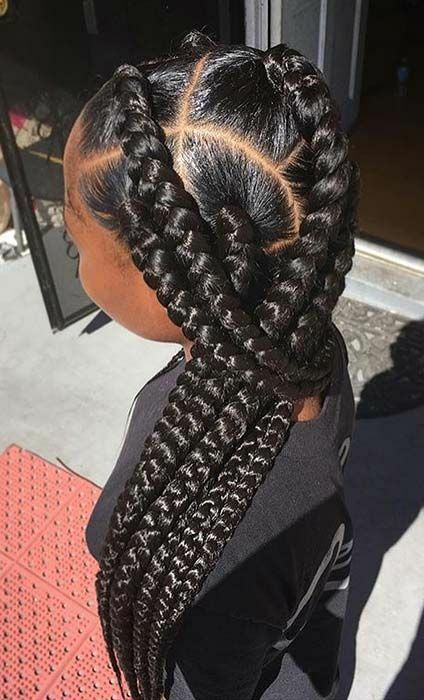 You really can’t go wrong with this classic look. 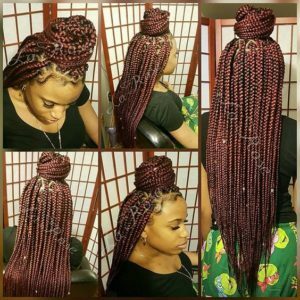 If you want to experiment with a new hair color, these gorgeous burgundy box braids are a great choice. The triangle-shaped parts create a subtle but cute design that you wouldn’t be able to achieve with classic box-shaped parts. 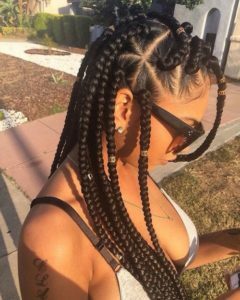 Triangle-shaped parts look especially cute with chunky box braids like the ones pictured here. 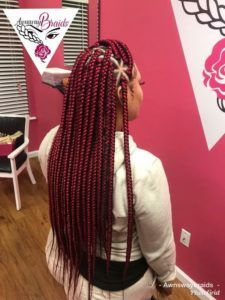 Chunkier braids tend to put less stress on the roots of your hair, making them a great choice for those who are concerned about breakage and damage. These pretty brown box braids are a nice option for those who want to try out a new color but prefer to make the color change more subtle. This shade of brown makes the triangle-shaped parts pop even more. 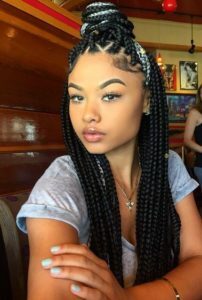 This style shows off the versatility of chunky box braids. They look equally as cute styled into a half up half down high bun as they do when worn down. If blue is your color, these gorgeous blue triangle box braids are a great choice. The pretty ombre color creates a nice contrast, especially when you pile them into a high bun. If you want to create unique look, try making just a few of your box braids grey. It’ll create a nice color contrast and make an otherwise simple look pop with color. If you want to take your next protective style to another level, try a bold color like this vibrant shade of red. 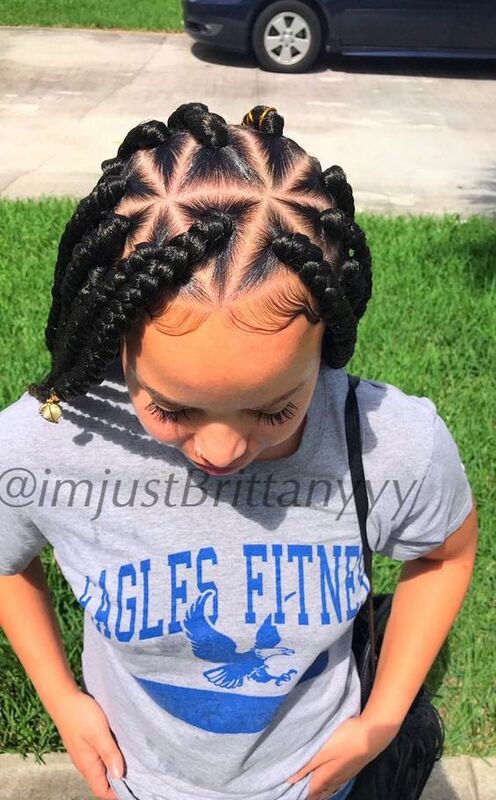 Getting box braids that are a different color than your natural hair really make the triangle-shaped parts stand out. 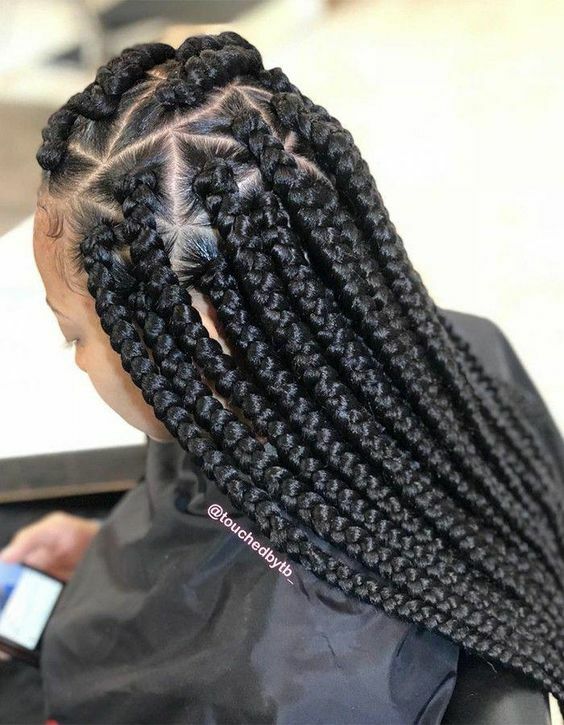 There’s something irresistible about the look of chunky box braids. 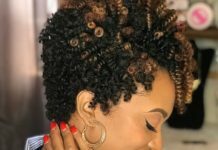 If you want to take the look up a notch, this gorgeous honey blonde color should do the trick. 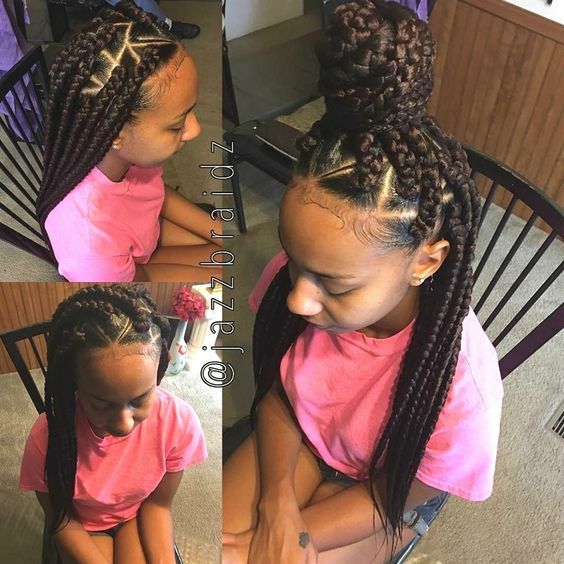 These gorgeous triangle box braids look great piled up into a chic high bun. Add a few gold beads for embellishment. 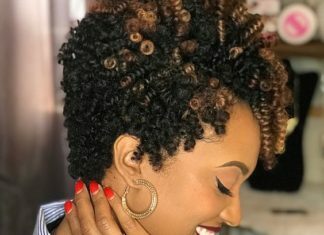 You can never go wrong with this look. 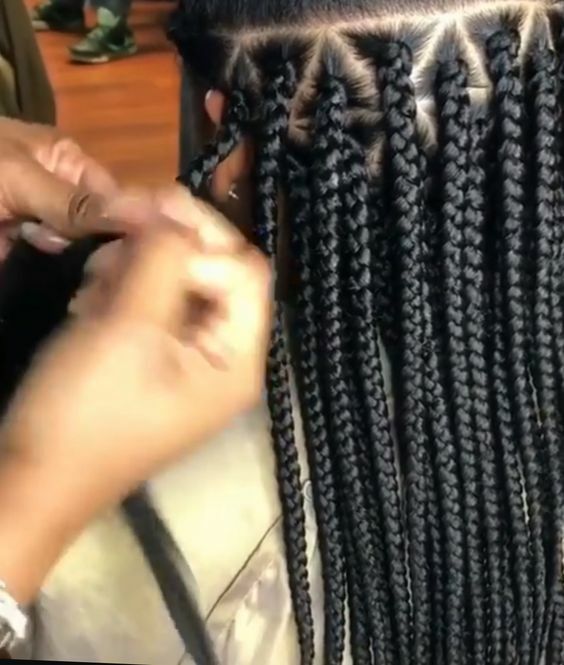 There’s something really chic and timeless about classic black box braids. 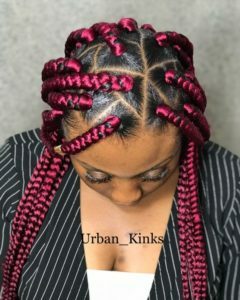 Synthetic hair like Kanekalon hair often has a nice sheen to it which makes your braids nice and shiny. 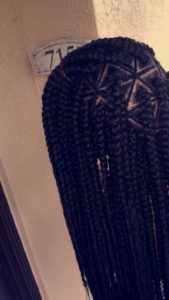 There are many different ways to style box braids. 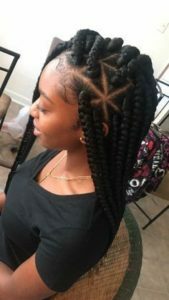 Splitting the braids into a half up half down high bun style is a great way to keep your braids out of your face and show off the triangle-shaped parts. 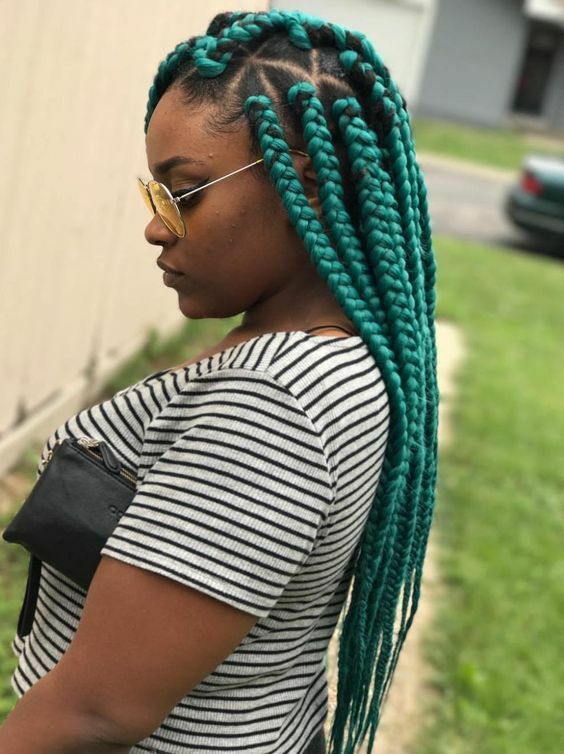 Colored box braids are always fun, but if you want a color that’s less common, try a look like these green triangle box braids. 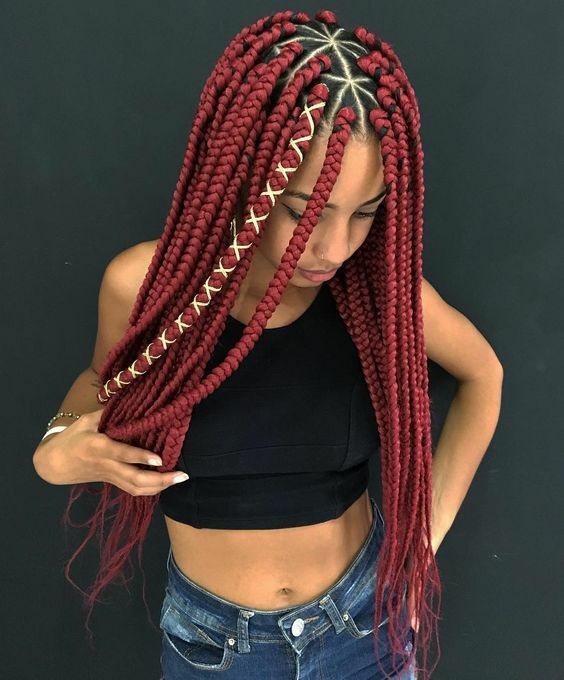 It’s a bold choice, but it’s undeniably striking and sure to help you stand out in a crowd. These pretty honey brown box braids are a great choice for the summer months, due to their sun-kissed look. 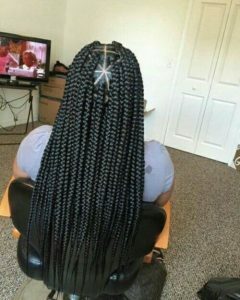 But this style works all year round, especially when adorned with a few silver beads. Not only are chunky box braids cute, but they take much less time to install than smaller braids. 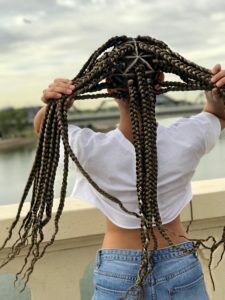 Chunky braids also put less tension on your roots, since there’s more hair for the braid to hold onto: just make sure the braids aren’t too tight. These gorgeous golden blonde box braids have hints of platinum blonde in them as well. The color contrast really helps offset the triangle parts, making this a really striking look. 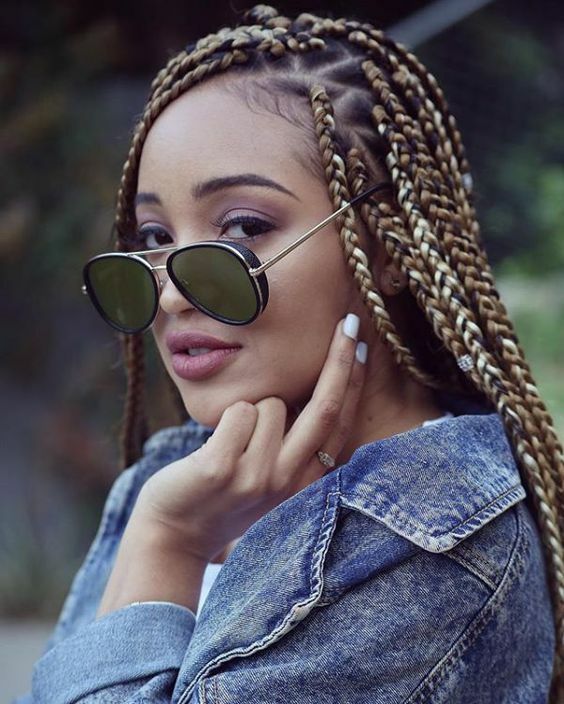 These ultra long triangle box braids are classically pencil-sized, but the curly ends help them stand out. 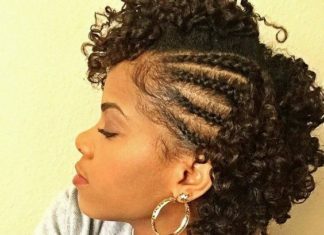 These braids look great when styled into an updo or ponytail, allowing the different textures to contrast against one another. 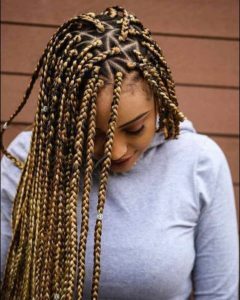 These simple but beautiful box braids are adorned with gold beads for a really striking, regal look. Parting this style down the middle helps show off all the pretty triangle parts. 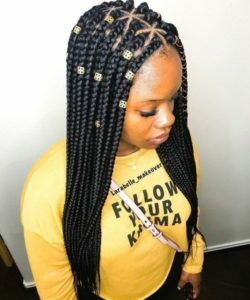 This is a classic example of medium-sized box braids: they’re a little larger than pencil-sized box braids but not quite larger enough to be considered chunky. This is a nice option if you can’t decide between small and chunky braids. 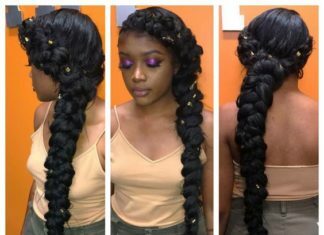 If you happen to prefer the look of sleek, shinier braids, consider using Kanekalon hair to create braids like these. These cute jumbo box braids are a subtle almost dark blonde shade that really makes the triangle shaped parts pop. It’s not hard to see why chunky box braids are so popular. Here’s a great example of the different shapes you can create when parting the hair for triangle box braids. 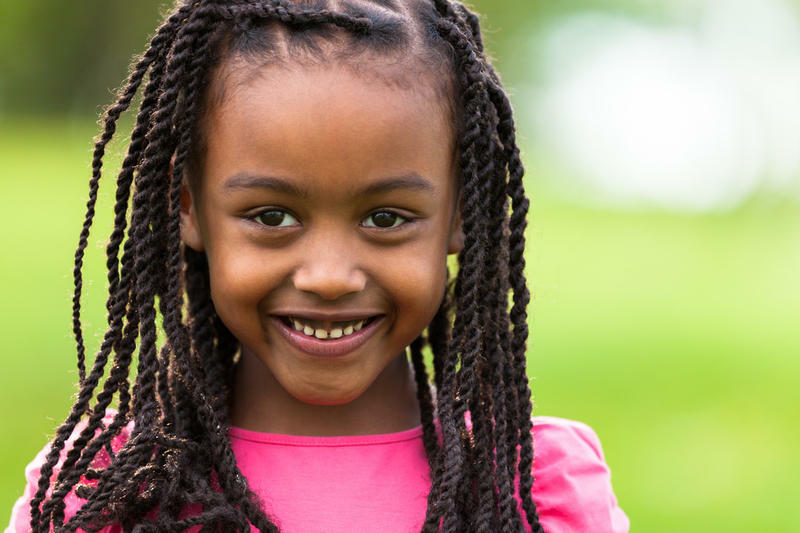 Show it off by styling the braids into pigtails or a half up half down style. 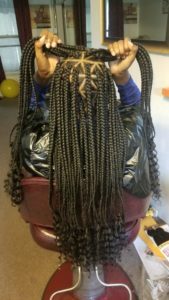 With braids this long, you have plenty of different looks to choose from. 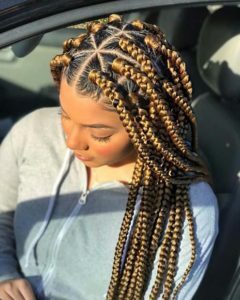 These pretty honey blonde box braids are parted down the middle, showing off the precise triangular parts. 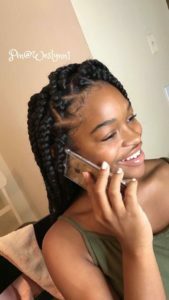 Chunky box braids have such a fun, youthful appearance to them: they’re a great protective styling option. A dark shade of red is a great choice for those who are a little more conservative but want to try out a new hair color. 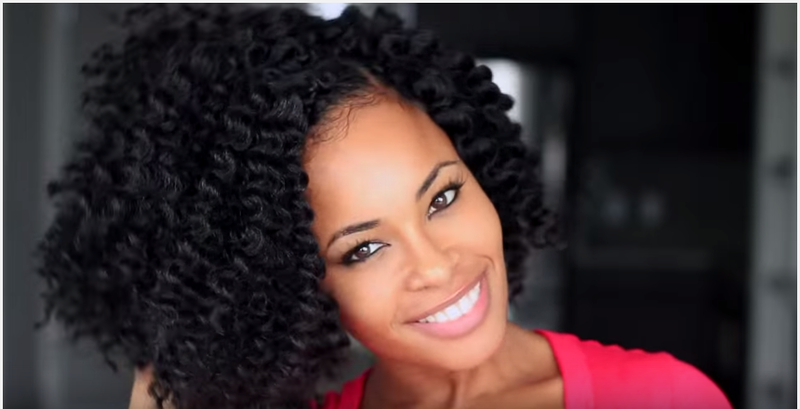 You can style these braids many ways, like this cute half up half down wrap-around bun. Kanekalon hair is a popular choice for box braids, but if you prefer a more natural, matte look (versus the sheen that dark Kanekalon hair tends to have), try using Marley hair for your box braids. You can never go wrong with a side part, even when it comes to box braids. 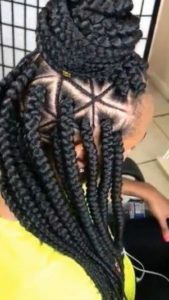 The great thing about braids is that you can easily part them on either side or down the middle using just your fingers. 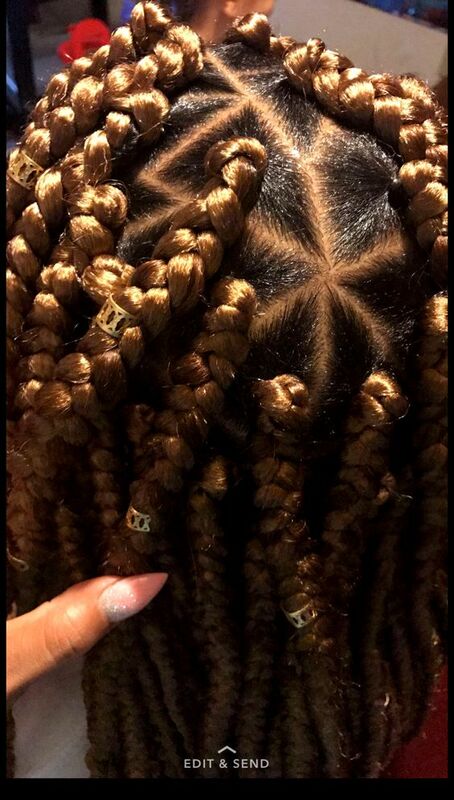 A side part also easily shows off the precision of the triangular parts. 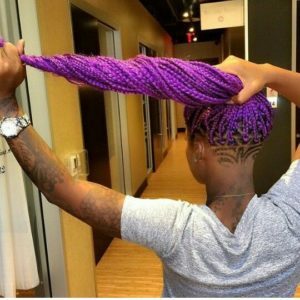 Purple braids (and purple hair in general) have become more and more popular in recent years. 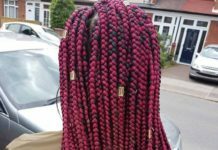 These pretty purple triangle box braids are a great choice for those who want to make a statement. 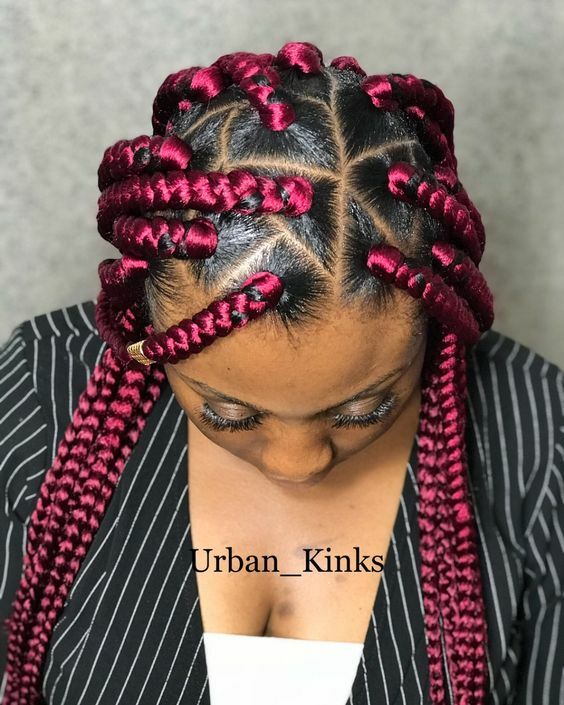 One of the benefits of using braiding hair that has some sheen to it is that your braids will continue to look fresh even after you’ve worn them for a few weeks. 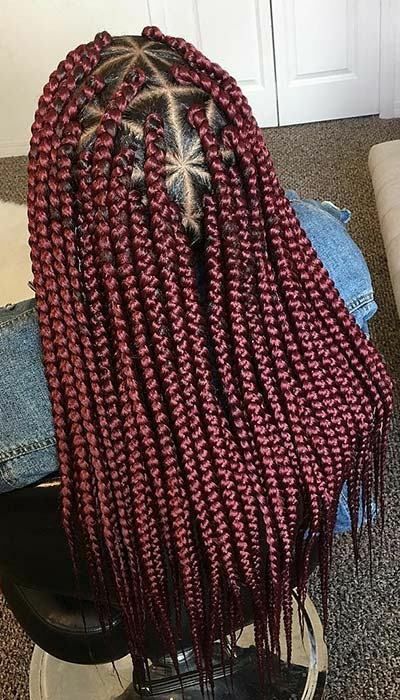 This shade of red looks great on just about everyone. It’s a shade that’s bold but flattering and not too bright. Add some colored cord for a touch of embellishment and to offset the pretty red hue of the braids. 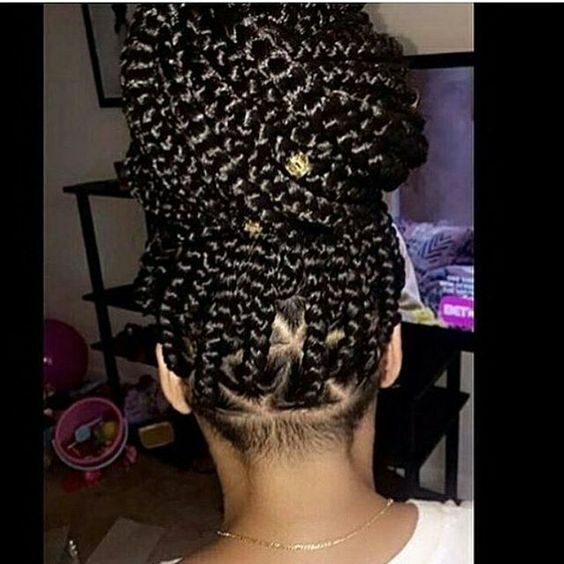 Gold beads are the perfect hair accessories for a plethora of different protective styles. These cute, medium-sized triangle box braids are no exception. 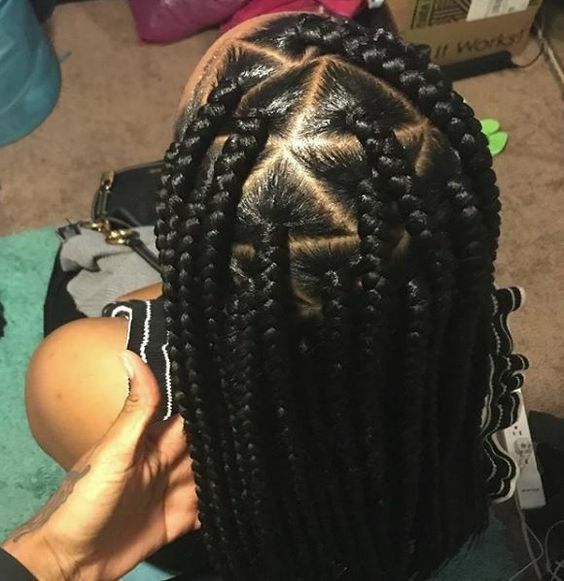 These gorgeous box braids have an extra layer of intricacy: the triangular parts are outlined with tiny cornrows, giving this style a much more unique look. These pretty triangle box braids fall right around the hips. 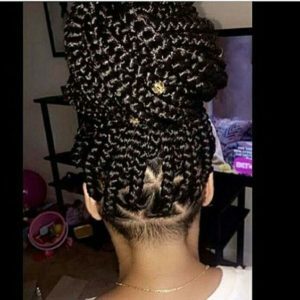 Light-colored cord is wrapped around a few of the braids, which really help the style pop. 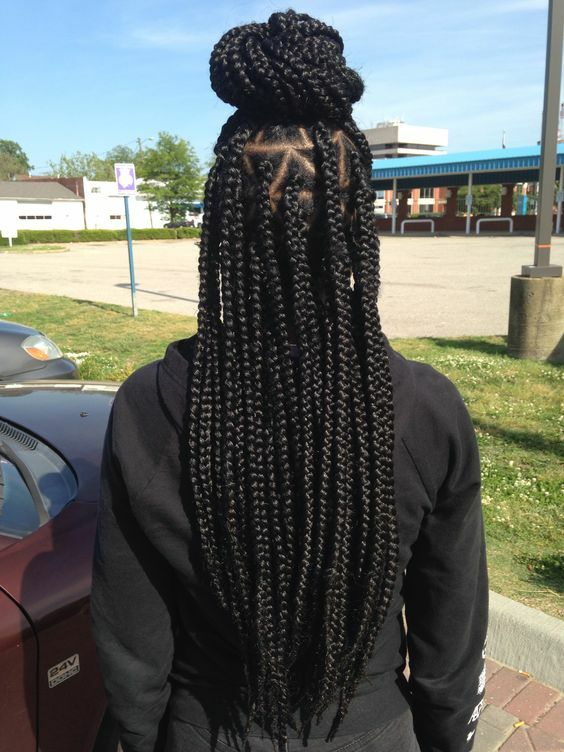 Here’s another great example of the simple beauty of classic, pencil-sized box braids. There’s almost no limit to the ways you can style these braids. 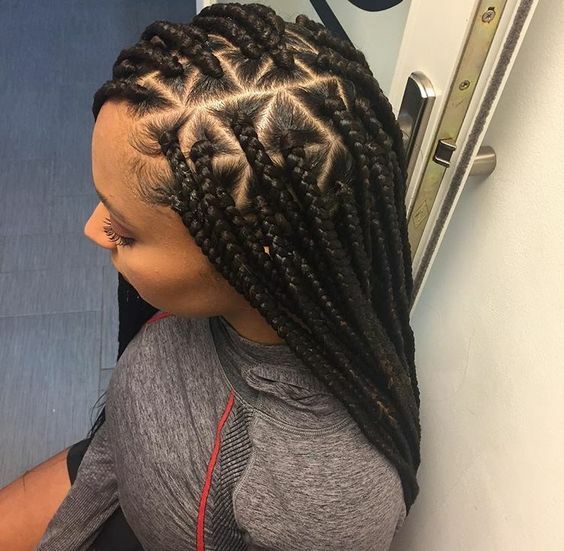 Here’s another beautiful box braids style that features cornrowed designs in between the triangular parts. 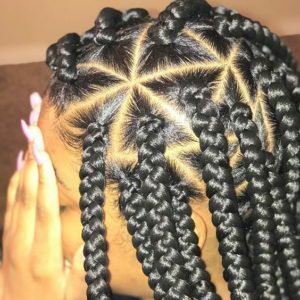 These braids are styled into a half up half down high bun, which easily shows off the criss-cross pattern of the cornrows. These long red triangle box braids allow you to play around with a new color on a temporary basis. Protective styles should be fun, so don’t be afraid to try something different.